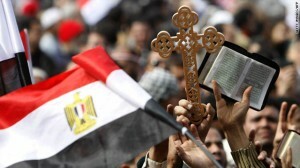 Religious representatives from Egypt speaking to the international Catholic pastoral charity Aid to the Church in Need (ACN) expressed the hope for a positive development in the crisis-ridden country following the fall from power of the Muslim Brother Mohamed Mursi. The Coptic-Catholic Bishop of Asyut in Upper Egypt, Kyrillos William, told ACN on Tuesday, July 9, that he regretted the many victims claimed on Monday morning in Cairo by the clashes between the army and supporters of the toppled President Mursi. According to reports, there are more than 50 dead and hundreds of injured. “It’s sad,” the Bishop said. In the meantime Bishop Kyrillos has expressed his hope that the situation would calm down. The appointment of the head of government on Tuesday showed that the situation was slowly beginning to normalize and the political transition was taking shape. “Life in general is carrying on as usual for most people in Egypt,” the bishop explained. The head of the Coptic-Catholic Church, Patriarch Ibrahim Isaac Sidrak, had stated previously to Aid to the Church in Need on Friday in Cairo that the deposition of the Egyptian President Mursi last week was something between a military coup and a second revolution by the people. “The military had not seized power. Furthermore, the people wanted a change and asked the military to help. Fortunately our army is on the side of the people. Egypt is not Syria,” the Patriarch continued. Mursi had not been able to fulfill the expectations set. “My impression was that he was not prepared for this task. I think one of the main problems was also that Mursi was not really President. He had a President, namely the head of the Muslim Brotherhood, and other people in this international society. It’s from them that he had received his instructions,” the Patriarch believed. Currently, the State President decides on a permit. It can often take ten years or more for an answer to come. Bishop Thomas described how, compared to the times under the former head of state Mubarak, prosecutions under the blasphemy laws had increased significantly. “Within one year, we have had many cases,” said the Bishop. Furthermore many Christians had been abducted by Islamists to extort ransom money from them. Time and again, there were violent attacks on Christians and their institutions and a lack of protection. Complaints made to the police following incidents with Islamist motives remained fruitless. The bishop described political religion such as the Islamism of the Muslim Brothers, as not a solution to Egypt’s problems. Rather, it was necessary to develop an awareness that democracy was more than the rule of the majority. This would mean, for example, that questions of civil status would have to be regulated for Muslims by sharia and for Christians by the precepts of their Church. Instead, he insisted that dialogue and respect would have to be the basis for dealing with the different social groups in Egypt.